Bereaved parents and anti knife-crime campaigners shut down Westminster Bridge in protest at the government's response to violent crime. Campaigners from OperationShutdown are demanding urgent action to tackle what they say is a "national emergency". Organisers have vowed to cause further disruption across the UK until change takes place. Home Secretary Sajid Javid said he had implemented "a number of approaches" to reduce serious violence. Marchers initially gathered in Whitehall to call for a meeting of the government's Cobra emergency committee to address the recent surge in violent crime. They held a minute's silence near the Houses of Parliament in memory of PC Keith Palmer, who was murdered by a terrorist while on duty in 2017, before moved to the bridge, where they sat down. "The government had better be listening," said Sandi Bogle, a former star of TV show Gogglebox whose nephew was stabbed to death in 2017. She said: "Brexit has taken up too much time and money, and for what? Nothing has come out of it - but our kids are dying." One of the organisers, Lucy Martindale, whose cousin was fatally stabbed, said the government held a Cobra meeting "if there is a terrorist attack and one person is killed". She continued: "Several people daily are being killed on our streets, why is this not being treated as the national emergency that it is?" 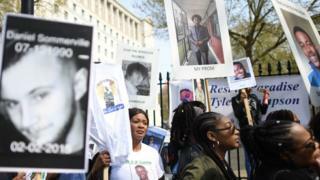 Image caption OperationShutdown members called the government's response to a spike in knife-crime "non-inclusive" and "tokenistic"
Tracey Hanson, whose 21-year-old son Josh was stabbed at a bar in west London in 2015, claimed many protesters were driven to act through "a sense of desperation". She said: "Should we be here doing this? No, we should not, but we are and I hope we are going to make a change." Another protester, who did not want to be named, said: "There is only so much disruption and shutdown that the country and government are prepared to take before they realise that this issue is not going to go away." He said the movement will and needs to spread to other cities because "it is not a London problem". In March the government pledged an extra £100m for police in the areas worst affected by knife violence. OperationShutdown organisers criticised the summit as "non-inclusive" and "tokenistic". The group is calling for changes to reduce violence including: independent investigation into school exclusions, better rehabilitation of prisoners to stop them going on to kill and for full jail terms to be served for murder and manslaughter. The Met Police has been approached for comment. Thirty-six homicide investigations have been launched in London since the start of the year, including 23 stabbings. The protest comes after extensive disruption was caused by a separate environmental protest, which has closed several central London locations.